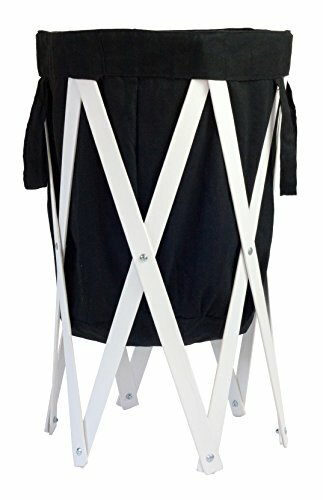 The MAX + RAE Collapsible Laundry Hamper with White Wood Frame is a great addition to any bedroom, laundry room or bathroom. Our wide variety of stylish fabrics is sure to complement almost any décor. The tall and slender profile of the MAX + RAE collapsible laundry hamper doesn't take up much space, yet will hold at least one full load of laundry. The fabric bag has two handles and easily detaches from the wood support frame, making it great for carrying your dirty laundry to the washing machine without using a separate laundry basket. To reattach the fabric hamper, simply slide the cloth overhang onto the six wooden support legs. You can also use the MAX + RAE collapsible laundry hamper to store toys in a kid's bedroom or clean towels in a bathroom. Fabric bag care instructions: Machine wash cold water. Tumble dry warm, or air dry. SATISFACTION GUARANTEE: If you are not satisfied with your purchase, just return it within 30 days for a full refund. BRAND NEW ITEM! Just launched on July 25, 2018. Be one of the first ones to review this innovative new product by MAX + RAE. DIMENSIONS: Fully expanded - Height = 27", Diameter = 17". Fully collapsed - Length = 28", Diameter = 4". LARGE CAPACITY: The fabric laundry bag measures 17" in diameter by 18" sidewall height, and will easily hold at least a full load of laundry. MATERIALS: Removable fabric bag with attached handles made from 50% polyester/50% cotton. Foldable wood frame made from pinewood, painted white. EASY TO USE: Fabric bag has 3" integrated overhang that simply slides over wood frame supports for quick removal and attachment. Free standing. No assembly required. Light weight yet sturdy. CONVENIENT STORAGE: Fabric bag and wood frame easily fold (i.e. collapse) together into a compact cylindrical configuration with 4" diameter. Conveniently fits under bed or in closet when not in use. If you have any questions about this product by MAX + RAE, contact us by completing and submitting the form below. If you are looking for a specif part number, please include it with your message.